Justus von Liebig’s Law of the Minimum states that yield is proportional to the amount of the most limiting nutrient, whichever nutrient it may be (Figure 1). Nitrogen is the nutrient that most frequently provides the largest response, suggesting that this is usually most limiting. 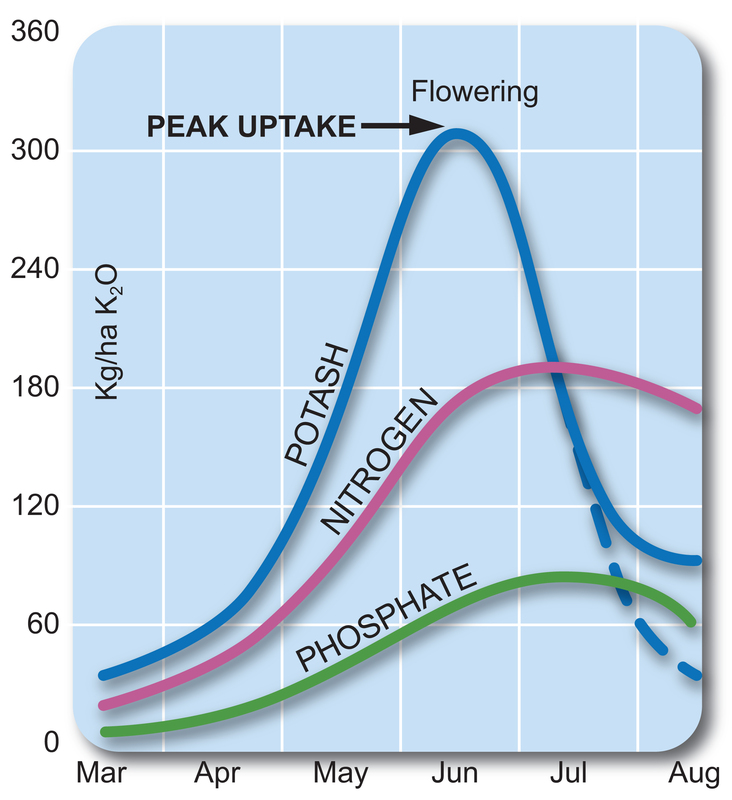 However, the plant available potassium status of a soil has a considerable influence on the uptake of nitrogen by crops, as shown through field experiments. Yield response to applied fertiliser nitrogen is decreased when the exchangeable K content of a soil is below a critical target level, index 2-. 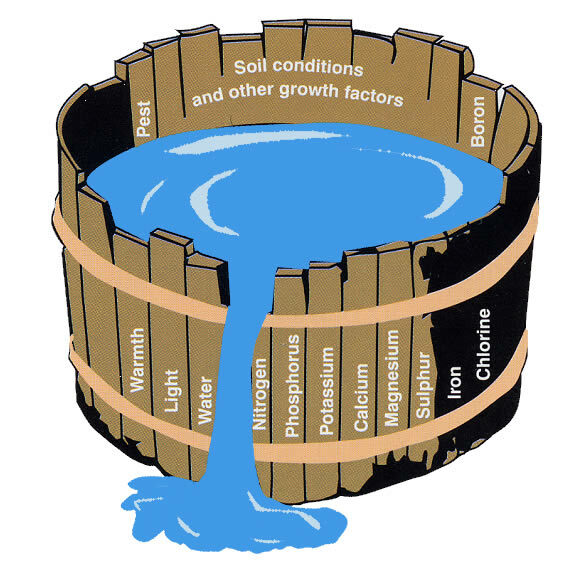 Potassium is very important in the relationship between water and crop growth through helping to regulate the amount of water within a crop. The importance of this for plants is to keep them turgid and upright, which occurs as a result of water flowing into cells, causing them to swell. 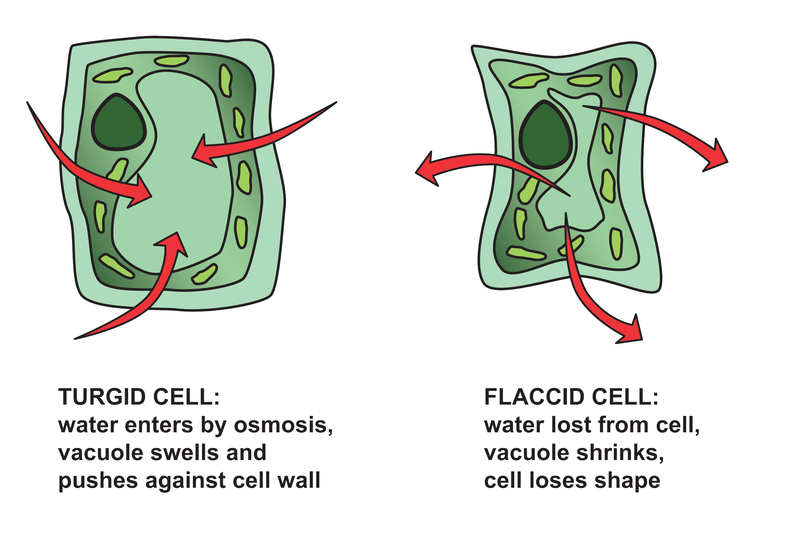 Simplistically, individual cells consist of an expandable cell wall enclosing a central space, the vacuole (Figure 2). Figure 2. Simplified representation of a plant mesophyll cell, showing the vacuole, from Mengel and Kirkby ‘Principles of Plant Nutrition’, IPI, 1987. 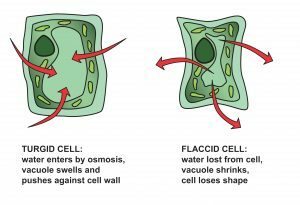 The vacuole contains an aqueous solution (plant sap), which is largely water. It also acts as a ‘general storage compartment’ for nutrient ions, like potassium, phosphate and magnesium, and other solutes like sugars. The movement of water into cells relies on the process of osmosis, where a higher solute concentration is required within cells to allow the flow of water in that direction (Figure 3). The solute most plants tend to use is potassium, which explains why it is vital for maintaining the turgidity (rigidity) of plant cells and tissues. The major determinant of growth and a prerequisite for large yields in most crops is the rapid expansion of the leaf canopy in spring. This allows improved capture of sunlight energy, required to convert carbon dioxide to sugars and then into dry matter. The increase in the size of the leaf canopy is driven by cell division and expansion, for which nitrogen is a major driver. As cells expand, the volume of water contained within them increases considerably, which has implications for the K requirement of the plant, with crops often containing in excess of 300kg K20/ha (Figure 4). The uptake of this potassium is needed to maintain the osmotic concentrations of leaf tissues (which otherwise will become diluted) at an effective level to maintain turgor. Much of the total N and K required by crops is therefore taken up to sustain development and expansion of the leaf canopy during the early months of growth. Figure 5: Response of spring barley to N fertiliser on soils with different levels of exchangeable soil K (Kex), Hoosfield, Rothamsted. These interactions have been shown through field experiments, a lot of which have been conducted by Rothamsted Research over the years. One example comes from the Hoosfield Barley experiment started in 1852, where large differences in soil exchangeable K have developed over the years between plots which either received fertiliser K or did not (Figure 5). When four application rates of nitrogen were tested on both high and low K soils there was a considerable difference in the response of spring barley to the applied N. From this the principle of N x K interactions is clearly demonstrated. The average yields between 2000 and 2005 show that there was no justification for applying more than 50 kg N/ha to the barley grown on the soil with only 55 mg/kg exchangeable K, but yield was further increased by an application of N of up to 96 kg/ha when the soils contained adequate amounts of exchangeable soil K.
High yielding crops need large supplies of both nitrogen and potash and it is no accident that the addition of N stimulates the need for, and uptake of, K. Nitrogen is mostly taken up as the negatively charged anion nitrate (NO3–) and to maintain neutrality the plant needs to take up equal amounts of a positively charged cation. Potassium as K+ is the preferred cation. Without sufficient potassium, crops fail to use water efficiently and consequently become more seriously affected by water stress in periods of drought. Plants also use N less efficiently and are less able to handle stress caused by frost, heat, water-logging and wind. Potassium has an essential role in plant disease resistance, probably the most effective of all the nutrients. It is a regulator of enzyme activity, and therefore involved in nearly all cellular functions that influence disease severity (Figure 6). From over 200 literature reports on the role of potassium on plant diseases 70% improved plant health. Conversely, the uptake of nitrogen has the potential to increase a plants susceptibility to disease and pest attack, due to the rapid growth response that can occur initially, the changes in plant tissue colour and increase in production of sugars. Potassium is required for the synthesis of proteins, starch and cellulose, cellulose being a component of cell walls. The function of cellulose on cell wall thickness not only acts on the plants standing power, but also as a mechanical barrier to invasion and infection by pathogens by reducing the movement of sugars out of cells. Potassium deficiency reduces cellulose production, leading to thinner cell walls and higher sugar levels in the space between the cells that stimulates fungal attack and germination of spores. 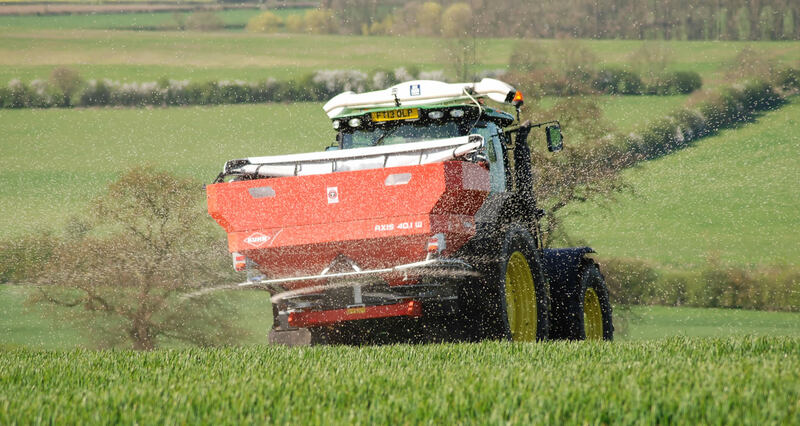 Where potassium may be in short supply from the soil there may be a benefit from top dressing with nitrogen plus potash in the spring, to ensure the shortfall from the soil is filled. 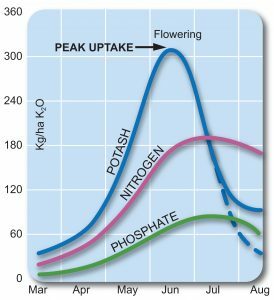 If potash is short and not corrected it will becoming limiting and full response to nitrogen will therefore not be obtained, resulting in lower yields and poorer crop performance. When there is insufficient potassium for this purpose, leaf expansion and stem elongation become too slow during the early stages of growth for the leaf canopy to expand and rapidly cover the ground. This results in inefficient interception of sunlight and photosynthetic production of assimilates required for the crop to grow rapidly and achieve maximum yield. When used carefully, nitrogen is usually the greatest agronomic stimulant to crop growth. But for it to be used efficiently in crop production and play its full role in increasing yield, a crop must also have access to, and take up, an adequate amount of potassium from the soil. This is because there is a strong interaction between these two nutrients in crop growth which decreases the crop’s response to applied fertiliser N when the exchangeable K content of a soil is below the critical target level. Because of this interaction, there is little point in applying large amounts of N when there is too little exchangeable K in the soil as the N is used inefficiently. There is also the risk that any excess unused fertiliser N lost from the soil will have undesired adverse effects on the environment. 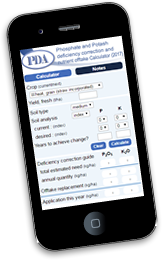 More technical information about Potassium and nitrogen interactions in crops in is available in the technical notes section of this site.